At a ceremony held in Cape Town on the 13th February 2018, the Ambassador of France to South Africa, his excellency Christophe Farnaud, bestowed the signet of Chevalier de l’Ordre de la Légion d’Honneur (Knight in the Legion of Honour), on one of the last surviving South African D-Day veterans, General Albert (Albie) Götze. It had been a long journey getting Albie his Légion d’Honneur and the South African Legion played a key role as part of the team which made this honour possible. So how is it that Albie Götze has been awarded France’s highest honour and how did it come about? In a nutshell, the French government decided that all World War 2 ‘Allied’ veterans (who took part in the D-Day landings and liberation of France should be given their highest honour for military and civil merit, the Légion d’honneur and they announced this on the 70th anniversary of D-Day in June 2014 as a special thank you those who fought and risked their lives to secure France’s liberation during the Second World War. Albie, as a young South African Air Force pilot was seconded to the Royal Air Force and he took part in D-Day operations flying a Spitfire doing beach sweeps and patrols. Albie Götze’s story is something else; he was born in January 1923 in Prieska, a tiny town on the south bank of the Orange River, South Africa’s Northern Cape. In mid-1942 he volunteered to take part in World War 2 and joined the South African Air Force and subsequently was selected for fighter pilot training. 127 Squadron arrived at North Weald on 23 April 1944, where it was equipped with the Spitfire IX. Operations began flying fighter bomber missions over France on 19th May 1944. The squadron played its part in the D-Day landings and subsequent days, and Albie and his colleagues found themselves flying sweeps of the landing beaches, escorting bombers, armed recces and dive bombing specific targets. 137 Squadron always operated at low altitude (‘on the deck’) and was mainly employed to attack targets such as armour, anti-aircraft installations, specific buildings, transports and enemy personnel. For this reason, flying in the Typhoon squadron was dangerous and high risk. The losses were extreme and hence replacement pilots were usually filled with volunteers. Albie’s aircraft was hit on occasions and he made a few crash landings with damaged aircraft. In 1951 Albie completed a combat tour with SAAF No. 2 squadron to Korea as part of a US Air Force formation where he flew P-51 Mustangs, and he has again received recent honours and thanks from the South Korean government for his involvement in the Korean War. Albie had a long and successful career in the SAAF, serving in South West Africa during the Border War and ended with the rank of Brigadier General. He was responsible for the introduction and implementation of the South African air defence system with the underground head station at Devon. He was also responsible for the system to be fully computerised. Getting Albie his due recognition and his Légion d’honneur from the French government for his participation in Operation Overlord was also a journey in its own right and as South African Legion we played a central and pivot role in securing this honour for General Gotze. It started when Tinus Le Roux, a renowned SAAF historian and filmmaker, contacted Lgr Peter Dickens and asked if the South African Legion in the United Kingdom and Europe could follow up on Albie’s Légion d’honneur application which he had assisted Albie with, there had been no response on the application for some months and they were concerned. Quick to the mark Lgr. Cameron Kinnear who in turn engaged Lorie Coffey at Project 71, a veteran’s charity in the UK, to look I into the matter. Indeed there had been an administrative oversight and Albie’s Légion d’honneur application was kick-started again by the South African Legion, and finally Project 71 was able to get a Légion d’honneur issued by the French Ambassador to the United Kingdom, her Excellency Sylvie Bermann. With a Légion d’honneur finally in hand, and in South Africa, Lgr Peter Dickens then contacted Philip Weyers from the South African Air Force Association (SAAFA) to arrange a suitable medal parade for a handover, Philip and SAAFA were able to engage the French embassy in South Africa, who very keenly agreed to undertake the official presentation to General Gotze. After all the ceremonies and official presentations were done, the French invited all to attend a small lunch, it later turned out that the French Ambassador to South Africa, his excellency Christophe Farnaud, was a keen modeller of aircraft and had built Typhoon models as a child. 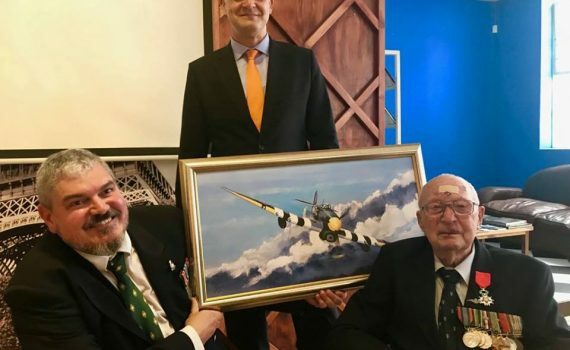 The Ambassador stayed to the end of the lunch to see a print of a painting of a Typhoon by the late Derrick Dickens presented to Albie in appreciation by Lgr Peter Dickens. 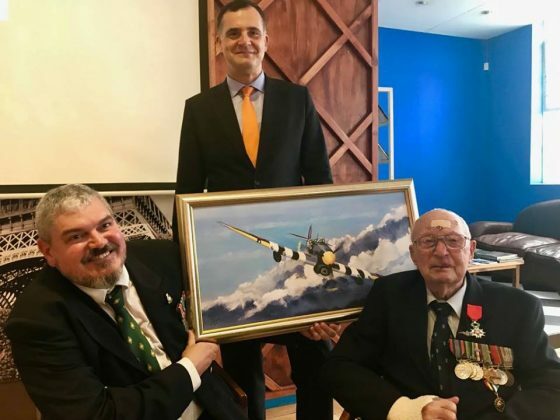 Looking at the painting Albie opened up with all sorts of harrowing tales of fighting and flying in a Typhoon much to delight of the Ambassador and the remaining guests and journalists. Image copyright, Karen Dickens, references attributed to Dean Wingrin and Tinus Le Roux.